Don’t eat all your grass: ground cover at the break of the season is important! Travelling around the Northern Dry Tropics Bernie and I regularly see bare paddocks on the same properties. It is accepted that there is often flogging around waters and on some land types in a paddock. 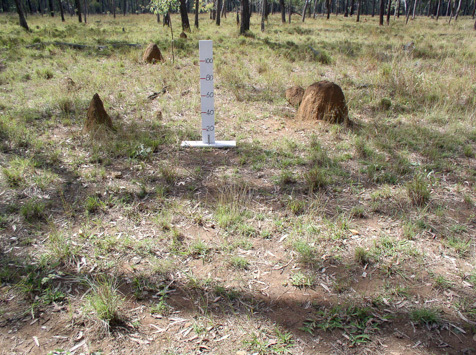 Likewise there may be 10–20% of years when seasons fail and some paddocks have to be grazed heavily. But these paddocks we see are bare most years from one boundary to the next. Some beef producers cannot bring themselves to leave enough grass and ground cover to protect the soil when the first storms arrive. From our experience and published research findings, it is clear that having at least 50% cover at the break of the season is a must. This ground cover slows runoff, reduces soil loss and increases rain infiltration. More infiltration means more feed for the cattle. This photo shows the absolute minimum you need on a red earth at the break of the season to protect the soil and give your country a chance to respond to rain. Beef producers and grass managers need to manage stock numbers to retain some feed coming into the wet. Retaining 600–800kg/ha of grass on light soil types equates to approximately 50% ground cover. We have two concerns about repeated overgrazing across large areas on a regular basis. The first is the damage it is doing to the reputation of the grazing industry. We find ourselves constantly defending the beef industry and its grazing management practices. We are passionate in our defence because we believe most producers try to look after their country while making a quid. But this is blown out of the water when large areas are overgrazed consistently by the same landholders. Our second concern is the false economy of this practice. There are many producers who tell us how conservative stocking rates, retaining cover at the end of the year and wet season spelling can improve the bottom line and greatly reduce financial and mental stress during dry years. At 20% ground cover (break of season), soil loss is 10 times greater than if ground cover is greater than 50% (Scanlan, Pressland and Myles 1991). Research on red basalt soils by Cogle and others during 1998, 1999 and 2001 demonstrated the dangers of low ground cover. Annual runoff from bare ground is seven times greater than runoff from areas with good ground cover. Annual soil loss from bare ground is 34 times greater than soil loss from areas with good cover. Joe Rolfe and Bernie English, Department of Agriculture and Fisheries.